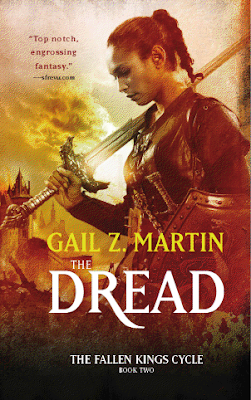 Author Gail Z. Martin is hosting her annual Days of the Dead blog tour, and she’s kicking it off with plenty of giveaways, special interviews, downloadable treats and hot news. We have one of only five different interviews Gail has done with her vayash moru (vampires), a group that play a significant role in all of her Chronicles of the Necromancer and Fallen Kings Cycle books. In anticipation of the release of The Dread, Book 2 in The Fallen Kings Cycle January 31, 2012, Gail has most generously provided a prize pack of a set of the books to date (signed!) which include The Blood King, Dark Haven, Dark Lady’s Chosen and The Sworn. This is an action-packed epic fantasy with terrific supernatural elements and I highly recommend it to UF fans that also like fantasy. To enter the contest, please fill out the form below. 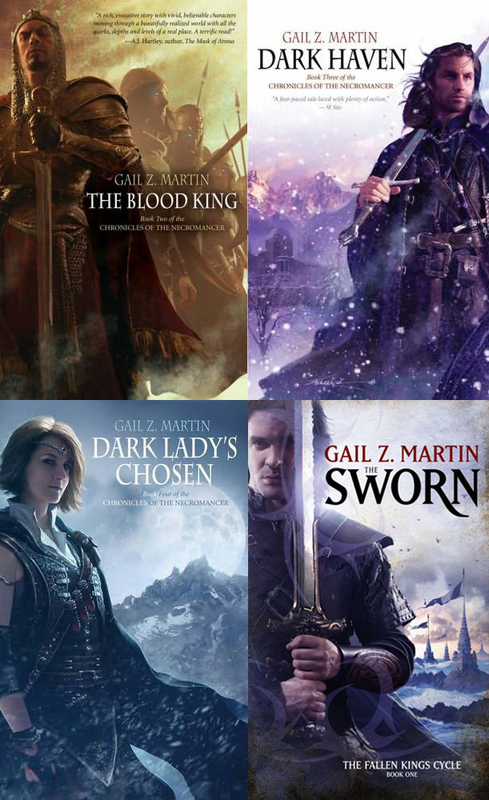 Feel free to leave a comment for Gail or if you have read the series share some impressions with other readers. 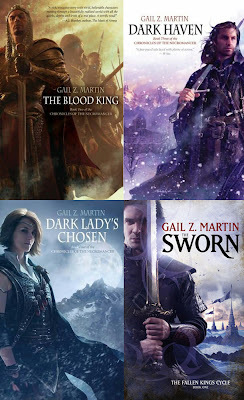 By Gail Z. Martin, author of The Chronicles of the Necromancer and The Fallen Kings Cycle series. Here, I'd like to introduce you to Kolin, a 250 year-old vayash moru in the service of Lady Riqua of the Blood Council. In the Temnottan conflict, he has been charged with protecting Aidane, a Nargi ghost whore who has communicated vital information from the spirits to aid Queen Berwyn and the Principality forces. A: That memory is also immortal and a heart that no longer beats may still break. Q: Lady Riqua has given you great freedom, first to lead the efforts of the Ghost Carriage to help persecuted vayash moru escape from Nargi, and then to accompany Jonmarc Vahanian north to Principality City as Aidane's bodyguard. Why? A: Jonmarc Vahanian has been a patron and champion of the Ghost Carriage, allowing us to use Dark Haven as a place of safety. He has risked everything on our account more than once, although he is mortal. For that, he has earned my loyalty and the admiration of Lady Riqua. Q: You have the skills to fight on the front lines, yet you remain in the Principality castle protecting Aidane and Queen Berwyn. Is this the best use of your talent? A: The queen is young and newly come to her throne at a time of great danger. My presence in the palace helps to assure her safety. Aidane brings a rare and valuable gift to the service of the queen in support of the war effort. I would protect both the queen and Aidane at any price. A: That even the passage of centuries does not erase regret. Very kewl interview! I've not yet read any of Gail's books so this is really a nice way to get started! Thanks for the chance to win! Gail is a new to me author, thanks for the intro. I love the entire Chronicles series and was panicked about it ending until I realized that my favorite characters are carried over in the new series. I just wish I didn't read them all so fast and have to wait for the next installment! Thank you so much! I hope you're enjoying the Days of the Dead! Happy Halloween. يقوم عمال مؤسسة نقل الاثاث بفعل فك لجميع قطع الاثاث التي تتطلب لفك، وهذا بهدف تيسير عملية تغليفها، وأيضا نقلها، فمثلاً يمكن نقل المجالس بنفس حالتها ولكن يلزم فكها لتصغير حجمها وفق ما يكون متوفر، ويقوم عمال مؤسسة نقل الاثاث بتحضير العفش في أعقابفكه، وكتابة كل محتويات قطعة الاثاث حتى يسهل تجميعها نحو اعادة تركيبها مرة ثانية عقب اتمام عملية النقل.